Friday 26 Apr - The iPhone 5c and 5s is currently in stock at most of our operators listed below. 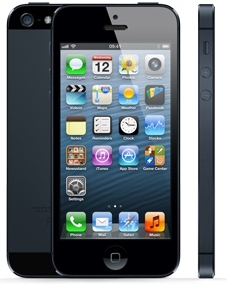 eBay has lots of new unlocked iPhone 5's from various third party sellers. Prices and delivery vary. Always worth a look. Also Dial-a-Phone, Phones 4U and Mobiles.co.uk currently have a good range of deals with Orange, O2, Vodafone & T-Mobile. Some of these have no up front costs. The iPhone 5 has now been released by Apple. The latest iPhone is 18% thinner and 20% lighter than it's predecessor the iPhone 4S. It features a 4-inch Retina display which has a greater height than the iPhone 4S but same width giving it a 16:9 ratio, matching that of widescreen televisions enabling you to watch HD video without letterboxing. The stunning Retina display has a resolution of 1136x640 with a pixel density of 326 per inch meaning that your eyes cannot distinguish between the individual pixels. Colour saturation is improved by 44% meaning images and games become more life like and vivid. CPU and graphics performance is twice as fast with the new A6 chip compared with the previous A5 whilst using less power enabling an improved battery life. On a mobile data connection up to 8 hours of browsing and talk time can be achieved ensuring you will have enough battery power to see you through the day. The iPhone 5 also comes with improved earphones now called EarPods. Quality of sound is vastly improved and together with noise cancelling technology they ensure you only hear what you want to hear. An 8 mega pixel camera is included with a new panorama function allow you to shoot impressive 240 degree photographs in one seamless image. Video recording has also been enhanced with 1080p HD capabilities and image stabilisation to ensure shaky recording is a thing of the past. The front facing camera is used for FaceTime video calls which you can make either over WiFi or a mobile data connection. A new smaller more durable pin connector has been developed for the iPhone 5 which is reversible ensuring there is no incorrect way to plug in the cable. An adaptor is available to ensure your old accessories will still work with the new device. 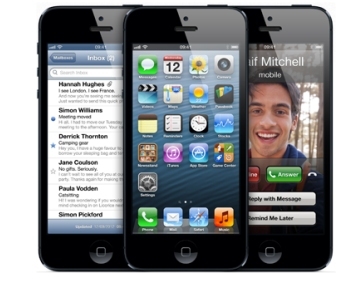 The iPhone 5 comes in Black or White colours and memory configurations of either 16GB, 32Gb or 64GB. We constantly check for iPhone 5 stock, so you don't have to. Receive email alerts when iPhone 5 online stock is found.